SR-AX100 - Universal Audio Adapter with Stereo & Dual Mono 3.5mm Inputs for DSLR Cameras & Camcorders. 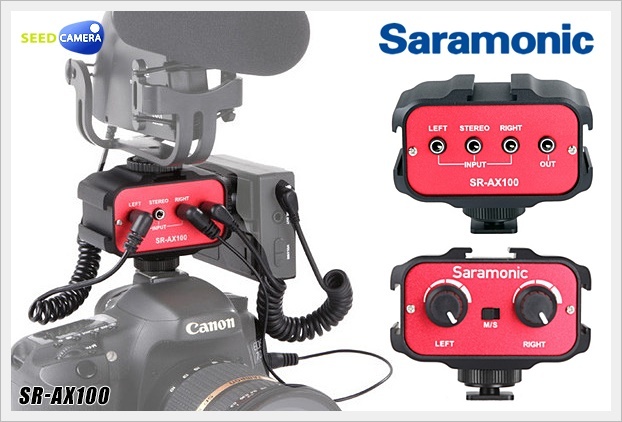 The Saramonic SR-AX100 is a 2-channel audio adapter ideal for recording professional audio on any DSLR or camcorder that has a standard mounting shoe and built-in audio jack. This adapter provides you with a compact dual-mic mounting and audio mixing solution, which allows you to easily mount and control two mics or wireless receivers. The SR-AX100 features a passive circuit, making it virtually noise free, and does not require batteries or a power source.